The protestors stood on the Piazza di Spagna in Rome, brandishing bowls of penne pasta. Above them rose the wide marble staircase of the Spanish Steps; nearby, turquoise water spilled from the square’s iconic marble fountain, just as it had for centuries. But on the far end of the plaza, just south of these defining Roman landmarks, was a new and alien symbol: the Golden Arches. Our century, which began and has developed under the insignia of industrial civilization, first invented the machine and then took it as its life model. We are enslaved by speed and have all succumbed to the same insidious virus: Fast Life. . . . In the name of productivity, Fast Life has changed our way of being and threatens our environment and our landscapes. Indeed, to many, “slow” has come to mean a way to live one’s life. If I am what I eat, then I will choose food that supports local growers instead of industrial agriculture; I’ll support diffusion rather than centralization. I’ll support sustainable practices over short-term profits. I prefer community networking to distant power structures, variety to homogeneity; adaptability rather than uniformity; authenticity over hype. Perhaps most importantly, slow has come to mean local. And yet slow food doesn’t mean we will eat only food from our own backyards; it is a celebration of everyone’s backyard. Wine makers call it terroir—the one-of-a-kind flavor that the soils and traditions of a place impart. 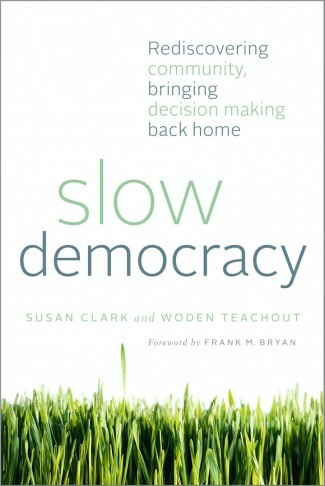 Slow democracy, in turn, is an invitation to bring the advantages of “slow” to our community decision making. Paralleling slow food’s push for authenticity in what we eat, slow democracy calls for firsthand knowledge of the local decisions that matter to us. Just as slow food encourages chefs and eaters to become more intimately involved with the production of local food, slow democracy encourages us to govern ourselves locally with processes that are inclusive, deliberative, and citizen powered. Reconnecting with the sources of decisions that affect us, and with the processes of democracy itself, is at the heart of twenty-first-century sustainable communities. Slow food celebrates diversity and local traditions: briny seafood from Maine, wild rice from the shores of Lake Superior, artichokes from the dry, hot hills of California. Similarly, slow democracy applauds the range of regional democratic practices. New England town meetings don’t need to be spread like frosting across American townscapes. Other, very different examples of slow democracy have taken root from Oregon to Georgia, and from downtown Chicago to coastal New Hampshire—each with its own regional flavor. Slow democracy celebrates the terroir of community process. “Slow” is a wise, almost tongue-in-cheek term—a raised eyebrow at what “fast” has come to mean. It’s not that slow food advocates like waiting around. Indeed, plucking a sun-warmed heirloom tomato from the garden and savoring it out of hand is about as “fast” as food gets. But this grazing is arguably a slow food experience, because it encompasses your handling of the tiny seed, your careful transplanting of the slim seedlings into the garden bed, and the hot afternoons of weeding and watering. Admittedly, with all of that satisfyingly in mind and the taste on your tongue, you might linger a moment with pleasure—but that’s a matter of choice. Similarly, slow democracy is not a call for longer meetings or more time between decisions. Instead, it is a reminder of the care needed for full-blooded, empowered community decision making. Slow food has shown that in the interest of efficiency and cheap food, policies often are skewed toward corporate agriculture and consolidation, resulting in food and food systems that are unnatural and unhealthy. Similarly, slow democracy observes that we have moved increasingly toward centralization and privatization of public resources and decision making. In the name of efficiency, we often give only lip service to citizens’ wisdom, and as a result, we wind up with unrepresentative, unsustainable decisions and a discouraged, democratically anemic citizenry. Over the past twenty years, scholars and practitioners in the emerging field of dialogue and deliberation have discovered a pent-up demand for authentic community interaction, in which citizens can have their voices heard locally and make a difference. Americans are eager for a return to community service; in one recent poll, nearly 90% of respondents said that they valued being involved in their communities. And with a new generation of technological tools at our command, we are more skilled in self-organizing than at any other point in our past. We have the ability to make choices that are more ecologically, economically, and socially sustainable, and the will to implement them. The message from slow democracy’s grassroots is clear: it may take time, but it’s worth it. If we’re going to take the time to slow down, we want quality. Slow democracy doesn’t mean we have to attend every poorly advertised, badly run city council meeting. What slow democracy can help us do is learn to identify authentic, healthy processes; participate judiciously and with the patient confidence that real change takes time; and support the people who engage us in meaningful decision making, so they’ll do it some more. Inclusive, well-run deliberations with effective follow-through can make an enormous difference in the life of a community. Finding a place in the life of the already overburdened and underprivileged—such as single working parents, or low-wage workers who string together two or three jobs—is one of the greatest challenges of slow democracy. But these are the populations most often shut out of the democratic process, and most in need of what it has to offer. Slow democracy incorporates people from all walks of life and the full range of the human condition: from talkers to doers, from those who value charts and graphs to those who love chatting over coffee. It makes room for those who like to talk at microphones but also celebrates the vast majority of us who would, frankly, rather die than make a speech. It builds on the already-existing web of relationships that form a community, recognizing that some of our best ideas come while taking a walk with a neighbor. And it forges new relationships, introducing us to people we might have avoided but come to appreciate. Slow democracy says to parents who want to understand local school spending and be able to influence it: we need your expertise. Slow democracy says to landowners who care about their property values and the decisions that affect them: you are not alone. Slow democracy gives a vocabulary to people who would like more decisions to be made with, not by, their leaders. It gives confidence to policy makers who have a hunch that citizens have valuable wisdom and skills to share. And it offers a checklist to those who wonder whether their community’s democratic process is all it should be. The slow food movement has spawned slow movements of other kinds. Most notably, the “slow money” movement urges economic support for local, sustainable endeavors and an understanding that quick profit should not be the only criterion for investment. Slow democracy takes its inspiration from these other movements. They are invigorating citizens to take back power from centralized institutions, and we seek a parallel understanding for our towns, schools, and communities. Slow democracy presents a paradigm shift: instead of seeing politics as something that is national, Washington-based, and out of reach, we can see the real possibilities at home. Communities have the ability to address fundamental issues and create real change. Many of them have already done so. We think the greatest promise of modern democracy lies right in our local communities. And our goal is twofold: to expand the power of those places where democracy is most vital, and to ensure that those citizens have the tools to govern themselves in the most inclusive, democratic, empowered, and effective ways possible. We recognize that there is always a gap between democracy (the political ideal) and government (the administrative apparatus that enforces laws and regulations). But that gap varies in size. Right now, on our national level, it is a chasm. It is hard to look at Washington and see anything that looks remotely radical or thrilling. But there are places—local places that many of us call home—where that gap is, or can be, much smaller. If our future holds an increased focus on local food, local energy, and local economy, then surely we will need to improve our skills at local governance. Many of the local/slow activism books (for example, Michael Pollan’s The Omnivore’s Dilemma, Carlo Petrini’s Slow Food, and Woody Tasch’s Inquiries into the Nature of Slow Money) and those that sound the alarm (Bill McKibben’s Eaarth) emphasize the need for everyone to come together to make change. But what will that “coming together” look like? With Slow Democracy we are taking that next step, proposing a shift in the way we think about community and democratic engagement. • Power—defining a clear connection between citizen participation, public decisions, and action. • In Austin, Texas, residents use a technique called “meeting in a box” to gather with friends and neighbors in hundreds of locations around the city, from community centers to living rooms, to offer their ideas on key city priorities like housing. Meeting results are sent directly to city staff members who use them to shape the city’s comprehensive plan for the future. • In districts of New York City and Chicago, and under consideration in a growing number of communities, a new participatory budgeting process means that local residents develop ideas for projects that would most improve their daily lives, on issues like street resurfacing and lighting, bike lanes, and parks and playgrounds. Then it’s the citizens, not representatives, who make the binding decisions on how to spend funds. • In Portsmouth, New Hampshire, citizens have used a community dialogue and deliberation approach to find creative solutions to school redistricting, sustainable development, planning, race relations, and other complex issues. • In downtown Chicago, the police department has been working directly with residents to identify priorities and solve problems for nearly twenty years; their approach has reduced crime rates and transformed their relationship with residents of many tougher neighborhoods. • In coastal Maine, a town that was ravaged by a Walmart battle is using a community planning process, with input from over a thousand residents, to save the town’s historic downtown and encourage economic development. • In seven northwestern states, inclusive community conversations have helped citizens of poor towns and reservations identify the poverty issues that affect them, envision solutions, and create local businesses and institutions to bring new life to their communities. Much of what we know about democracy we have learned from “watching the show” at the national level. But what may be true about national democracy is not necessarily true in our towns and neighborhoods. So if we’re going to engage politically at the local level, many of us will need to relearn what democracy means. Too many people have turned away from the political process because of widely held ideas and myths that don’t hold true at the local level. Let’s address some of the more common ones. There is a time for advocacy; but it’s not all the time. We can struggle to find the best answer; but that doesn’t always mean we have to fight each other. Media reports might make us think that if there’s no controversy, then nothing is happening. But with creativity and respectful deliberation, citizens are often able to find workable solutions at the community level. Significant transformations can happen locally and spread outward from there. Our national two-party system is set up to create winners and losers—and to keep all other perspectives out of the equation. At the local level, democracy can look much different. With careful work, we can help reduce that left-right dynamic and create new cross-community connections. Instead of being about “winning,” local democracy can actually be about making the best decision. Then, in the long run, everyone wins. When we lose faith in our local government, we turn our backs on one of the most valuable allies we can have. We need to make our local government a “we” and not a “they.” This will open doors to resources, power, and the natural flow of ideas that comes from a functioning democracy. The person who coined the phrase “a camel is a horse designed by a committee” had obviously endured a torturous group process. We’re going to highlight some of the breakthrough processes now being used at the local level; these aren’t your grandfather’s budget meetings. You’ll see how they’re helping communities make thoughtful decisions and how you can make them happen in your community. Yes, many of today’s issues are complicated. But local people are smart and invested—with access to national resources that can help them figure out the intricacies. That’s all the more reason to seek out local wisdom and creativity. Slow democracy doesn’t mean we don’t need outside experts. It only means that we should use them as consultants, rather than handing our power over to them. No one knows more about living in your community than you and your neighbors. In today’s interconnected world, communities are finding myriad new creative arrangements to tap citizen energy, talents, and, yes, expertise. Citizen involvement takes time. But with democracy, we get to choose: Do we want citizen participation up front, which comes with the side benefits of local wisdom and buy-in? Or do we prefer to take a gamble on making speedy decisions and spending even more time cleaning up afterward, in a firestorm of cynicism, backlash, and protest? Slow democracy gives communities the wisdom to identify which public questions are most ripe for public engagement, and the skills to take them on. We agree. Gridlock is destroying us at the national level. That’s why we need to get things moving at the local level. Communities are making progress on budget decisions, race and social conflicts, and finding creative environmental solutions that our national leaders can only dream about. So whose side is slow democracy on? Is slow democracy a left-wing Occupation to wrest power from corporations? Or is it a right-wing move to shrink government down to the size where we can drown in a Tea Party teapot? We know that slow food has a leftie reputation. And we’ll admit it from the beginning: as coauthors, on most issues we’re over there on the left ourselves. But we want to be clear. Slow democracy is not about the left talking among themselves. Nor is it about strengthening a uniquely progressive agenda—unless you believe that getting more people engaged in local decision making is purely a left-wing enterprise. Instead, slow democracy is about dropping the left-right labels and trying to find real-world solutions to real-world problems. While this presents an enormous challenge on a national level, it is remarkably doable on a local level. “Freedom and Unity” is the motto of our home state of Vermont, and at times we are awed by the wisdom of that balancing framework. We can’t help but notice that our motto doesn’t give us the choice of “Freedom or Unity”; but then again, we never found the motto of our good neighbors in New Hampshire, “Live Free or Die,” very practical. We each must have the freedom to pursue happiness, but each of us also has some responsibility for the common good. Adopted in 1788, back before Vermont was even a state, “Freedom and Unity” has held us together through extraordinary deliberations, from whether to join the cause of the Civil War to whether women should be able to vote to whether to allow civil unions and gay marriage. The motto offers us guidance only, not answers. As historian Joseph Ellis noted, even America’s founders knew they could never create a constitution or governance structure full of answers; instead, their legacy to us is much more valuable: “a framework in which the salient questions could continue to be debated.”8 The founders’ gift to us is a structure—slow, perhaps, but astonishingly durable up until now—for finding the right balance, on each issue, between freedom and unity. Freedom: when we arrive at the table, we’ll argue the merits of our various economic, environmental, and social concerns. Unity: we will put our heads together to find the best possible balance of those priorities. Freedom and unity: with every decision we make, we’ll also weigh whether we are strengthening or weakening our democratic structure. Even as we engage in democracy, we must simultaneously keep an eye on protecting that democracy. Reaching for the fastest, cheapest, or most “efficient” answer, if it bypasses the democratic process, will exact a lasting price. Working on the local level, with a balance of freedom and unity, we see the possibility of reinventing government in our own times. Slow Democracy is a call to turn toward our local communities and the ways we can govern ourselves right here, right now. The book offers broad principles that citizens can use to create a healthy local democracy. Some public meetings are satisfying and productive; too many are infuriating, at best a waste of time and at worst disempowering, leaving everyone hot-faced and angry. Slow Democracy offers the tools and vocabulary to identify what went wrong in those cases—and to ensure that we can do it better the next time. Part 1 explores the need for slow democracy. It highlights the surprising parallels between our current democracy and industrial food production: the ways in which they both centralize and privatize their operations, removing control from the local level. It describes the decline of local decision making and the rise of a model of expertise that effectively disenfranchises citizens. And it looks at the ways in which communities are fighting back, taking action to regain power that has been usurped by state and national entities. In part 2, we show how our twenty-first-century world is uniquely suited to slow democracy. It is the top-down, expert-driven thinking of the twentieth century that is now passé; today’s decision making can be flexible and democratic. Society’s ability to organize no longer belongs solely to large institutions and governments; electronic communication tools allow for unprecedented networking and collective action. At the same time, insights from new fields can help us improve our self-governance and problem solving. Cultural cognition explores the ways in which people make sense of a complex world; it helps explain how our existing political structures, particularly at the national level, funnel citizens into opposing camps and shut down possibilities for creative thinking. The field of dialogue and deliberation explores the ways in which people can create that much-needed communication, offering inspiration and techniques to help us transform traditional top-down processes into engaging, citizen-based conversations. Part 3 draws on these new developments to identify the elements that are essential to slow democracy. First, slow democracy must be local, with direct connection between citizens and the issues that can and should be decided in the community itself. Second, it should be inclusive, drawing on participation from across the community. Third, it should be deliberative: a process that requires a foundation of trust and that calls for citizens to define the problems, trade-offs, and solutions. And fourth, it must be empowered, giving people the political, economic, and social tools to follow through on their decisions. Part 4 offers reflections on the historic role of slow democracy in our country through an exploration of two long-standing American institutions, the jury and the New England town meeting. And we explore the question of when to use slow democracy techniques, recognizing that there is also a time for advocacy. Finally, in the appendix, we offer a set of “slow democracy rules”: tips and reminders to help foster slow democracy. This is not a “how-to” or facilitator’s handbook, although if you plan to embark on creating more deliberative processes in your town, we highly recommend that you get one (and we provide a list of resources at the back of the book as a place to start). There’s no one single formula for slow democracy. Instead, slow democracy, like slow food, is going to look different in different places. Rural and urban, east and west, north and south: each has its own traditions and its own logic, and a genuine democratic process will reflect that. To that end, we tell the stories of communities that are doing exciting work. Each is specific to the place from which it springs; it is the product of that particular community and the strategies it has chosen. But these stories also have a power beyond themselves, the capacity to spark ideas in those sitting far away in different circumstances. As you turn these pages, we hope you start to envision how you might bring some of their insights and strategies to work in your own community. This article is excerpted from Slow Democracy: Rediscovering community, bringing decision making back home (Chelsea Green, 2012) and is republished here with permission of the publisher. Learn more about the book here. I find the deep-seeded desire this article expresses encouraging and fascinating; furthermore, I agree to an extent with the above quoted sentences from the article. BUT, whose authority will drive and define precisely what the “common good” is? Without a definition of that, I don’t trust the authority that will have to force me (at the point of a gun, ultimately) – for my own good, of course – to look after that so-called common good. At that point, we’re back to Mr. Franklin’s idea of democracy as two wolves and a sheep voting on what’s for lunch. I do hear encouraging echoes in the article, perhaps, of Mr. Calhoun’s concept of “concurrent majorities” (to me, another way of defining community). If you all up in Vermont (Long Live the Vermont Republic!) desire to order your house one way and are willing to allow us, for example, down here in the South, or in Italy, or in Timbuktu, for that matter, to define what is best for us, I’m all for it. Let the conversation begin! What we need are some professional Terroiristes. The chief benefit of the slow Food Movement is that it produces good food and so is attractive, rather than driving fear into the hearts of our current generation of paranoid disquiet. One may think that we have a wise and trustworthy Augustus as emperor today, but I fear the very powers that he and his predecessor cultivated will lie in wait for the Neros and Caligulas lurking in the shadows, awaiting their turn in history books yet unwritten.